/ IS EVERYTHING READY TO GO? Since announcing my no-dessert year. I have received emails about nutrition strategies. Here is one tip about food: The best way to stick to a plan is to have one. Decide in advance what you will be eating and prepare it ahead of time so that it is there in your environment, ready to go. There is nothing worse than opening the fridge when you are starving and grabbing the first thing that you can put your hand on, good or bad. First, it is best if you don’t have ‘bad’ stuff in your fridge altogether (see tip number four: Don’t have it at home). Now even if we have relatively healthy food in our fridge, when we are hungry or are pressed for time, we most likely will reach for something quick and easy. If I had to start boiling quinoa and hard-boiled eggs every time I am ready to make my lunch salad, I would most likely never eat salads at all. Too much work! I’ve made a habit of doing my food prep for the week on Sundays. It allows me to make sure that the salad making process is simple and appealing. Nothing exciting about a bowl of spinach with a slice of tomato. I make my salad healthy and copious at the same time. You can see in the last chapter of my book THINK Yourself® HEALTHY where I tell you the full list of what goes in my salad. The trick is to identify your favourite foods and make sure you always have them handy and ready to be mixed. The salad making process becomes a bare five minutes’ deal which increases the chances of your eating it. 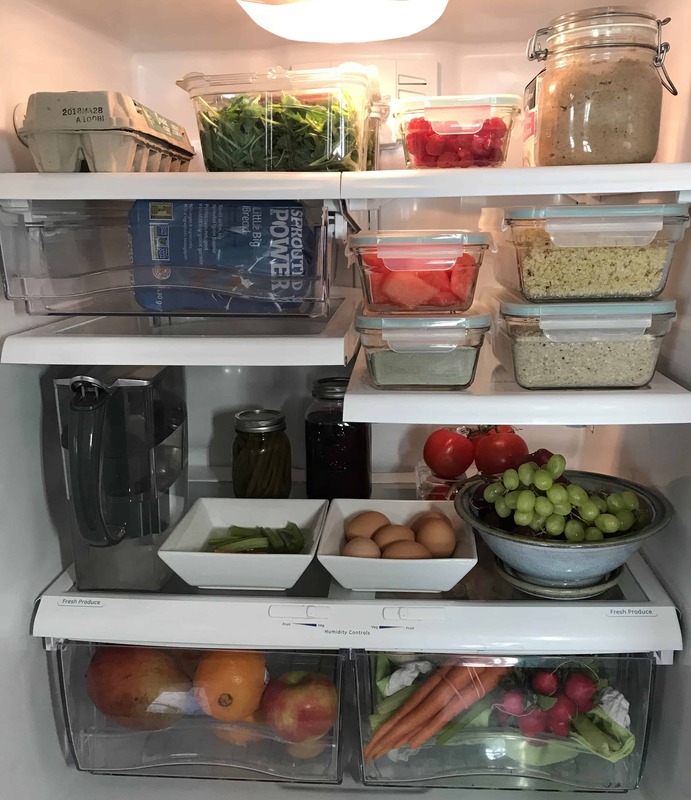 Here are a few of the foods I prepare during my Sunday routine, which takes between thirty minutes and an hour depending on the week, as I do everything at once. My process requires a little bit of multi-tasking but it is so worth it in the end. Quinoa: I always boil 200g (1 cup) of quinoa, which takes 18 minutes. I choose either white or red quinoa which contains 8 grams of protein per cup. As I choose not to eat meat, I need some sources of protein to ensure I get the amino acids I need to keep me healthy. Quinoa also offers me a feeling of fullness, as it is one of the rare starches I eat. It also soaks up the dressing and tastes fabulous. Eggs: I start my eggs and my quinoa at the same time. I put 7 or 8 eggs in a pot with water and use the same 18-minute timer. It takes about 8 minutes for the egg water to boil and 10 additional minutes for them to cook. When the quinoa timer rings, I take the eggs off the stove and rinse them with cold water and place them in an open bowl in the fridge, ready to grab to put in my salad or eat as a snack. Mother nature has made a perfect combo when creating eggs. Did you know that to better absorb protein, you need to also eat healthy fat at the same time? The amount of fat in the egg yolk is the perfect amount required to absorb the amount of protein present in the egg white. When people ask me what I think about using egg whites only to make an omelette, my response is always: unless your doctor told you that you had a problem with cholesterol, the egg yolk is fabulous for you. Now if your doctor said you that you had a cholesterol problem, many other things are a lot worse than an egg yolk. Remove all animal products from your diet before removing the egg yolk and once it is all out of your system, test again and more likely your doctor will be pleased with your results. I do limit my egg consumption to 7 or 8 per week. Steel-cut oats: While the other things are cooking, I place 200g of steel-cut oats mixed with hemp hearts and sprouted chia, with 800g of water (4 times more), in a pot on the third burner of the stove. Steel-cut oats take longer to cook, and I would most likely stick to the instant stuff if I had to go through it every morning. I boil it a little longer than the quinoa. When the quinoa and the eggs are cooked, I put the eggs away, then put the quinoa in a glass container in the fridge, and then I address the steel-cut oats which have taken an extra few minutes on the heat. Because I added very-absorbent chia to the oats, and because the soaking process continues for a long time even after they are removed from the stove, I add a few hundred grams of water as I know it will continue to thicken as it cools. I leave the oats in the pot in the fridge overnight, and I store it in a glass container the following day once it has absorbed the extra water. In the morning, all I have to do is to grab a big dollop from the fridge and warm it up on the stove with a half banana or frozen fruit. Frozen fruit: When in season, we purchase fresh fruit from local farmers: between 15 kg and 30 kg of mix-and-match berries, blueberries, raspberries, and strawberries. We clean them and freeze them on cookie sheets (which keeps them from clumping together) in the freezer for a few hours before transferring them into bags that will last us all winter. We also buy pitted cherries from a farmer in Kelowna B.C. who sells them already pitted and frozen. (Yes, I find pitting cherries a bit outside my enjoyment, so I buy them already pitted). Veggies sticks: My husband arranges veggies such as carrots, celery, cauliflower, broccoli and peppers and puts them in a bowl of water in the fridge, for us to grab easily whenever we get the munchies. If we don’t have time to prepare them, I even buy the expensive veggie trays at the grocery store. In the end, it costs me a lot less than having to miss work because of being sick. Vegetables keep me healthy. my plate. I don’t peel them. I place them whole in enough water to cover them, and boil them for sometimes an hour, or until they are soft when I try to slice them with a knife. I strain them and then use yellow plastic gloves to remove the peel which comes off in seconds as I rub the beet in my hands. I place them in a glass container in the fridge and have all my ingredients ready for the week! All I have to do is to buy fresh greens!